On Sunday 30th November, 20 members of our stellar team pulled out all the stops to walk 10.9 miles of the South West Coast Path. The able bodied team fuelled and hydrated themselves for a 10.30am start from the hotel in Dawlish Warren along the long and winding path to the Samuel Jones pub just off Exeter Quay at just after 2pm. With the walk being a popular route amongst guests as well as locals and tourists, we decided to document each step of the way for those looking to follow in our footsteps (and to prove to all our lovely sponsors that we actually did it!!!). We started by joining the South West Coast Path just at the rear of the hotel next to the Southern railway line before heading east towards Cockwood. While the weather was dry, bright and fresh, the team steamed ahead rosy-cheeked for a solid 45 minutes before arriving in Cockwood. Not long after passing Cockwood, we strolled into through the quaint and picturesque town of Starcross. Here we did a quick pit stop to regroup and rekindle our energy for the next stretch of our journey. The next landmark on our travels to Exeter city was past the stunning Powderham Estate and park; also home to one of the region’s most treasured and loved castles in South Devon. After walking a long stretch of the South West Coast Path overlooking the vast opening of the River Exe, we arrived in Turf Lock. Upon arrival at Turf Lock, once again we took a five minute breather to wait for the group to come back together and rehydrate before setting out on the next five mile stretch from Turf Lock to the finishing line. While the last few miles weren’t directly on the coast, the team saw the atmosphere change from vast expanses of coastal landscape to the quiet tranquility of the Devonshire countryside. Around 2.30pm, the team arrived on the sunny Sunday afternoon at Exeter Quay. Fresh faced (to say the least!) with nothing more than a couple of blisters and some pumped leg muscles, a successful trek had been achieved. 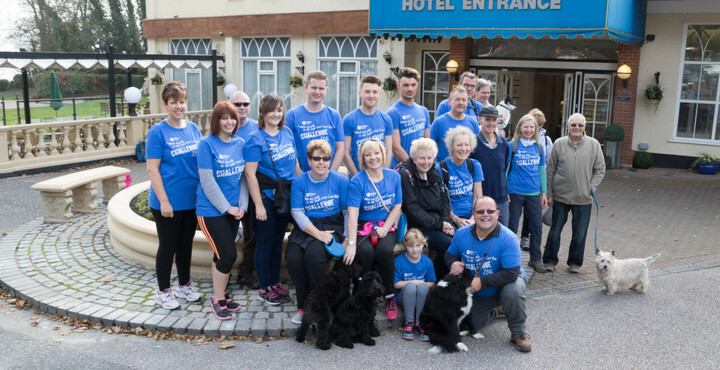 On behalf of the Rogers family and the whole team at the Langstone Cliff Hotel, we’d like to thank everyone for their support and sponsorship. In total we raised over £1,000 in registration fees and donations which will be going directly to the South West Coast Path not-for-profit organisation to help maintain and regenerate one of the most treasured attractions in the South West of England. Watch this space as next year could bring a whole new route into the mix! Suzy has plenty of stories to tell about Langstone Cliff, and we’ve asked her a few questions to find out just what her time working at the hotel has been like.